Sometimes chicken breast can be boring especially when it is cooked the wrong way that is why when we have some bad ones we call them white bread because they taste like one. Chicken breast when overcooked will become dry and tough making it unpleasant to eat but there are tricks in cooking them so they won’t become rubber like in texture. When I first started cooking I hate using this chicken part and always opted for the thighs and legs but once I learned how and when to use it I started loving it. So what are the tips to make it tender and juicy? Season it with salt and leave it for 30 minutes, salt acts as a tenderizer, kills bacteria and adds flavour to your meat. Note: do not leave it for more than 30 minutes as it will draw the moisture out of the chicken. Before cooking make sure chicken breast is in room temperature, not fridge temperature. This will make the cooking time faster. Cook chicken breast quickly as over cooking it will yield a rubbery texture. Now you might be thinking its unsafe to do this and I definitely agree with you but only if the thickness is wrong hence the trick here is to cut them perfectly in steak like thickness (around 1.5 cm thick), then all you need is 3-4 minutes cooking time on each side. If you are using it for curries and stews then I suggest slice them in strips with the same thickness and place them in your boiling curry sauce for 6 minutes then turn the heat off. Make a nice sauce to complement the chicken. Simple isn’t it? Now let’s create a simple recipe and try those tips I mentioned above. Season chicken breast with salt then leave it at room temperature for 30 minutes. Rub chicken with olive oil, lime juice, garlic and pepper. While grilling combine and toss all Peach and Mango Salsa ingredients in a bowl. 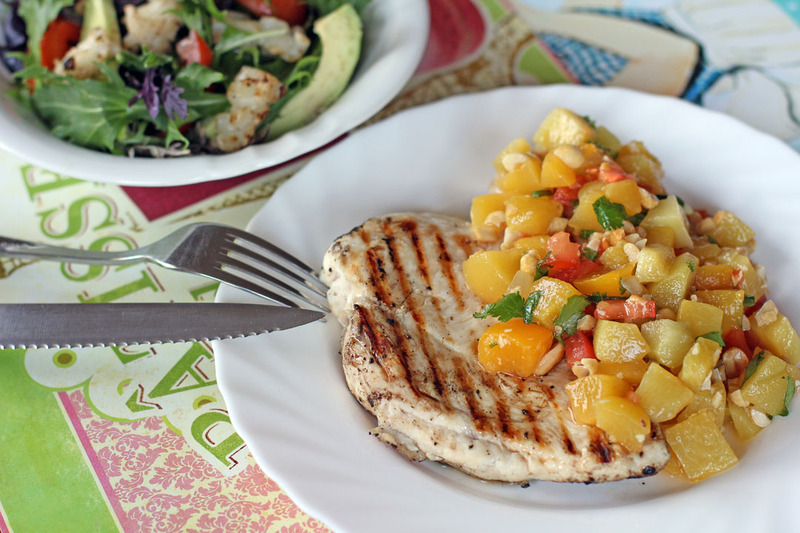 Remove chicken from grill then serve it with Peach and Mango Salsa on the side. I liked the sound of this before I looked at the pictures and recipe. Looks great and I also like the look of the salad with avocado. Thanks for the tips on how to grill the chicken breat. It has always been my problem. Good recipe for my husband and me bcuz our blood sugar is above the borderline. Thanks…. I want these for dinner! This is so my kind of meal, Raymund!!!!! I love the combination of those fresh flavors with the grilled chicken. Good tips Raymund. Good chicken is so good and bad chicken is awful! Your fresh fruit salsa looks so refreshing. I love the peach mango salsa! So bright, fresh and flavorful! Love that salsa! Great tips on how to make chicken breast stay moist and succulent Ray ! I agree there is nothing worse than rubbery grilled chicken breasts. Great tips on keeping it moist and tender. Now that peach and mango salsa sounds so delicious and I bet it would yummy on grilled pork as well. 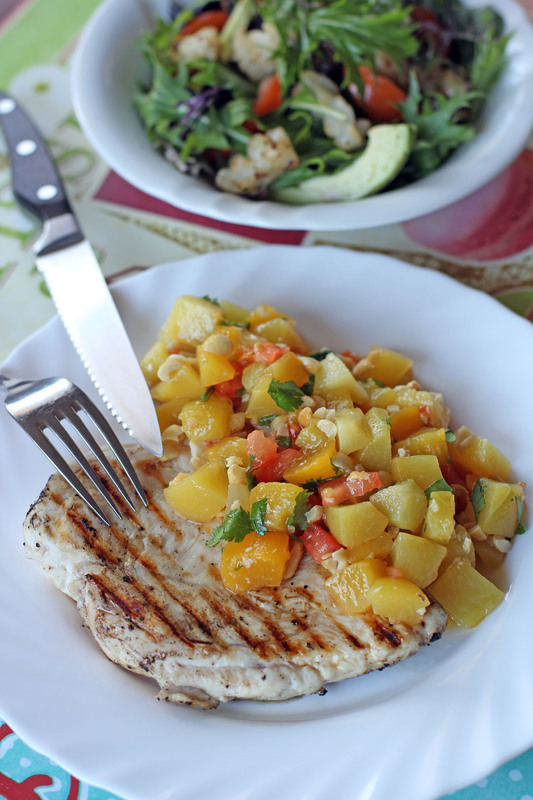 Great tips on cooking boneless chicken — i’m drooling over that summery delicious peach mango salsa! !